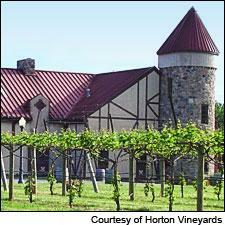 From Horton comes a juicy and flavorful 2009 Viognier. Virginia’s wine industry has been growing in recent years, albeit quietly and out of the limelight. The state now counts over 140 wineries, up from 46 in 1995 and behind only California, New York, Oregon and Washington. Virginia is the seventh-largest commercial grape-producing state in the country, harvesting 7,000 tons of grapes in 2008 (from 2,500 acres of vines), a 25 percent increase from the previous year.